On every new smart phone, there is a timer application. 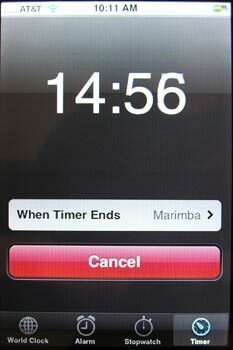 When the timer goes off, one typically hears a pleasant, familiar and repetitive tone (“marimba” on the iphone). For any child, the timer provides both a visual reminder (numbers counting down on the screen that they can reference) and an objective auditory cue (repetitive tone going off signals that “time is up”). My suggestion for parents who struggle with their children during times of transition, is to try utilizing this simple timer application. Example: Going to the park to play on the play structure (Expectation: We can only play for 10 minutes before we have to leave). 2) “When 10 minutes is up, we have to leave. You will hear a song (play the song before hand to allow him/her to be familiar with it) that tells you, ‘time to go'”. LET YOUR CHILD PRESS START TO BEGIN COUNTDOWN. 3) Attempt to slow your child’s body (rhythm) down as you notice that the time is moving closer to the 10 minute mark (ex: pushing your child on the swing back and forth, swinging slower and slower). Give a 2 minute warning. 4) When the timer goes off, use alot of facial affect and ask your child – “What’s that mean (big eyes, silly confused look)?” Give you’re child a few seconds to take his last swing, last trip down the slide, etc (but try not to allow for more than one “last try”). Make sure he/she presses STOP. Let me know how it goes by leaving a comment under this post. Parents are constantly asking me if I know of any “groups” that their child on the spectrum can take part in. These parents often tell me that they’ve looked high and low and cannot seem to find anything but a monthly parent support group or something infrequent to that effect. When I did my own search, I found that they were completely right! My challenge to all parents, therapists, teachers, and other involved is to vocalize this need to others and take action. Connect with other parents and create your own weekly meet-up. Social interaction and skill-building groups do not need to happen under the watchful eye of a professional, they can happen with a few parents sipping coffee at the park while their children play on the swing set (or look over the shoulder of another playing their DS). However, THEY NEED TO HAPPEN. 1. Compile a list of all of the children you work with who you believe could benefit from/outwardly are asking for more social interaction (friends). 2. Go to each parent/caregiver and ask if they would be interested in putting their name and number on a list with other families who are interested in getting their child more supportive and present peer experiences (this also provides the opportunity for families to connect with one another for support). 3. Help set up the first meeting at someone’s home/park/restaurant/place of interest. 4. Ask parents to have their child bring one object of interest (Nintendo DS, book about space, favorite train,etc) to help spark interactions around areas of similar interest. 5. Accept that at first, simply being around other peers is benefiting your child/student/client’s social-emotional development and that real relationships will form later. 6. Sit back and be amazed at how many others wanted/searched endlessly for the same thing and congratulate yourself for being an agent of change in your child’s life. For many years I’ve kept a little black book (now IPHONE) with or around me in case of a sudden idea. This blog is meant to be a continuation of that idea. You will notice that the ideas I share in this blog will be targeted at the developmentally disabled population. I am a strong believer in helping DD individuals and their families become increasingly more independent, connected and active in the communities. Currently, few resources and fewer groups exist throughout the country where children with disabilities and their families can socialize, receive support, exchange ideas, and feel connected. A goal of this blog is to bring support, empowerment, and practical ideas to families of children with developmental disabilities.